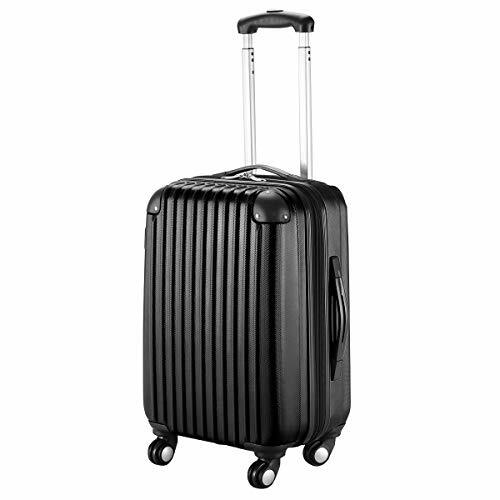 This is our brand new and modern 20" trolley suitcase which is constructed from lightweight ABS material and features an embossed scratch-resistance shell, a heavy duty handle and 4-wheel spinner for effortless moving. Inside the suitcase, there is elastic tie straps to minimize shifting your contents and a zipper divider to create two separate interior compartments. Take This trolley suitcase, Take Your Pleasure Along The Trip! Overall dimension: 13" x 10.5" x 22.5"
Max Height of the handle: about 22.8"
️【Multi-directional Spinner Wheels】4 Multi-directional spinner wheels for ease of 360 degrees movers stably and smoothly. ️ 【Lightweight and Durable】This luggage is made from ABS material which maintains a good balance between lightweight and firmness. ️ 【Water-proof & Scratch-resistant】 ABS Material to protect your contents from water, tea, rain and other liquid during travel; with rigid hard shell, it is tough to leave scratches on the surface of this luggage. ️ 【To Keep Your Belongs Tidy】The interior features joinable elastic belt and an internal zipped divider (perfect for ties, underwear, socks and other knickknacks), to keep the contents in place during transit. The fully lined interior has organizational pockets to keep your belongs tidy. ️ 【To Be Comfortable & Safe】Sturdy ergonomic aluminum telescoping handle will not make you feel unpleasant, and a smooth corner will not hurt you when bump into the corner of the luggage.